The lovely fragrance of a real Christmas tree, but one which grows in it's pot from year to year! Supplied at a height of 100-120cm total (including pot), keep outside all year - just keep watered. Use year after year! It's impossible to beat that stunning fresh pine fragrance that a real Christmas Tree brings to the home. That's where our fabulous Living pot-Grown Christmas trees are a real winner. Yes, you get that lovely pine room fragrance, but it will not drop the needles and you can keep it from year to year too - saving a lot of money over 5 or even 10 years. The Norway Spruce is the classic Christmas Tree. Grown on the same farms as the cut trees, they have been nurtured and trimmed in just the same way. But, because they are grown in their pots - they can easily be kept for many, many years to come. Just a little water in the rootball when used indoors each year, and once the decorations come down, pop it back outside and keep it growing. In itself, it is a beautiful evergreen garden tree, lovely all year round. It needs no special feeding or pruning - just ensure it does not dry out in summer. Very slow growing, you can use it for many Christmases to come. Living Christmas Trees - combing fresh pine fragrance, little needledrop and saving you money over buying a tree every year. Adopt one now! Premium quality, trimmed to shape, 5 year old British pot-grown Christmas Tree . Total Ht 1-1.2M (3-4ft) including pot. Give a little water to pot when indoors over festive season, and place outside once finishes, and it will happily grow for many years. 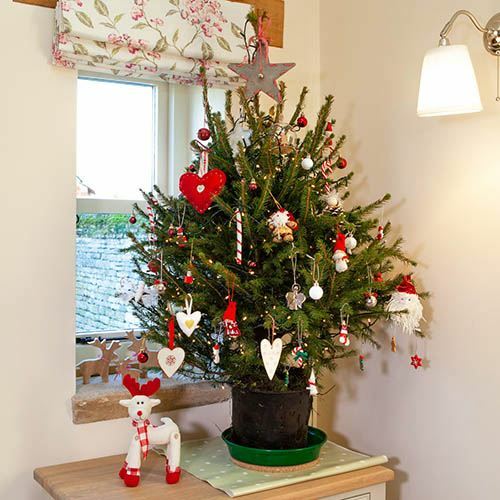 Keep your Christmas tree watered and out of the way of draughts and artificial heat such as radiators. To maintain the plant's distinctive shape, remove any misplaced or diseased branches in winter. Plant out of the way of drying winds.